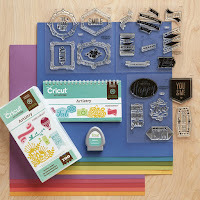 I have signed up as a Close to my Heart consultant again and have an Artistry Cricut Collection to give away to one lucky person!!! *Share this post on facebook and then come back here and post a comment telling me you did so. So sorry but this giveaway is open to U.S. addresses only. Go to my website and in the bottom right corner you will see "September Gathering" Click on the word "join". For every $25 you order you will get an extra entry. I will draw a winner after Friday, November 11th, 2016. As a bonus.......For every $50 you order I will also send you a "M size" (2 x 2) stamp set free from me. EDWINA BROWN IS THE WINNER. I WILL BE CONTACTING YOU SOON. This is a beautiful set. Thank you for offering this as a giveaway. I shared this on my page. I liked and shared, thank you for this opportunity. Very nice of you! This is very nice of you! Thank you for the chance. Liked and shared on Facebook. I liked and shared. I would love to win this!! Awesome package!! I just love what you're doing. We all need help and inspiration! Love the give away too! Very nice of you to do this giveaway! Shared and thanks for the opportunity to win! Thanks for the great giveaway! I shared gladly! Shared! Love these! I just started using CTMH stamps. I only recently learned that there were CTMH cartridges. I shared... :D Thank you so much for the chance to win..
Love that you are giving away CTMH Artistary Set. I love Cricut and CTMH. Thanks for your generosity and I'll be hoping I win but know whoever does will love it! I liked and shared, thanks for the chance! I signed up with CTMH several weeks ago and I'm so excited and would love to win. Thank you for the chance, liked and shared. What a generous giveaway! I absolutely love that cartridge. I have shared your info on my fb page! Way to go Oma! Shared. This is a wonderful gift! Thank you!! Shared! Love these and thanks for a chance to win. Shared and love CTMH Cricut stuff! Thanks for the giveaway and hope I win! I shared your Giveaway Post! and now I'm going to follow your blog. Thanks! I've shared on FB. Great giveaway!!! Thank you. I have shared and liked your post! I shared on my facebook (Tammi Dorn). Would love to win, as I've always wanted these! I would love to win this wonderful cartridge. Thanks for the chance. I shared your post. Great giveaway !! Liked and shared. ( thanks melody for Oking this post). And I will follow the blog too !! I liked and shared this. Thanks for this generous offer I shared your post. Shared! Would love this. My mom and I are gearing up to make my wedding invitations. Thank you so much for the giveaway! Liked and shared. Shared, thanks so much for such a generous giveaway! Thanks for the opportunity to win. I shared on FB. I shared on FB! Thanks for the chance to win! Thank you so much great blog and I shared!! fingers crossed! I shared. Great blog thank you for the chance to win fingers crossed!! This is an exceptional cartridge. Thanks for the opportunity to have it. Shared. Shared! Thanks for the chance to win. I shared and My comment was I am honored to interact with a fellow christian and what an awesome give away this is. I shared! Thank You! Enjoyed visiting your blog! ou are so sweet to offer this giveaway! I shared with my FB friends. Shared on Facebook! Thank you for posting this giveaway! I shared your contest on Facebook and would like to thank you for the opportunity to win this. I liked and shared on facebook. Thank you so much for the chance to win such a wonderful giveaway. Thanks!!! I have shared on Facebook, Thanks so much for the chance to win this cartridge. Liked and shared - thanks for this opportunity!